Hello there! Anne Marie here. Wow! A great week of submissions for our Monochromatic challenge featuring Crisp Cantaloupe and Calypso Coral. 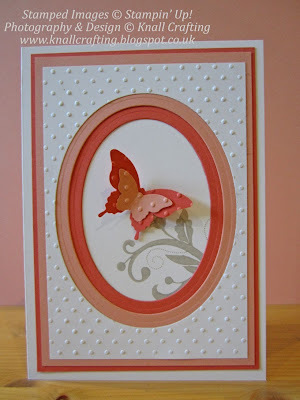 There were so many gorgeous creations this week but my eye was drawn to this wonderful card by Paula. I absolutely love the double matted frame that draws attention to the sweet die cut butterfly and hello...dots...love the dots!! 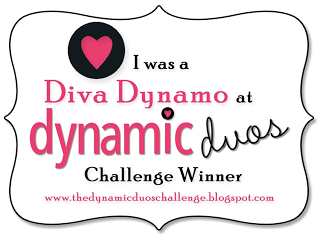 Huge congrats Paula on being the Diva Dynamo this week!! Please grab the badge below to put on your blog. Be sure to join us tomorrow for a new challenge with our Mix and Match Challenge, which we hope you will enjoy! 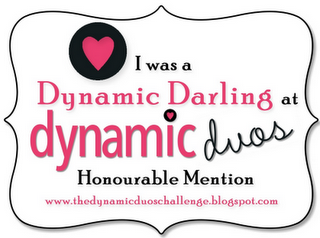 Awww, thank you so much for allowing me the honour of a Dynamic Darling, Susie!!! Means a ton to me! Especially when the gallery was so full of absolutely amazing creations! Thank you!!! Thank you so much! Big smiles! Thank you Alison!!! Congrats to Paula and all the winners! Thanks so much, Michelle, and whoop whoop to all the other winners! Thanks so much Tracey for choosing my card. As others have said, all these cards are beautiful.